Wailea Beach Villas, an elite oceanfront property set amidst an 11-acre tropical garden, opened its doors May 1 with world-class accommodations for the most discriminating travelers. Rates range from $1,100 to $3,000 nightly with a five-night minimum. To celebrate the grand opening, the resort will provide guests an evening with a personal chef when they book a stay in a two-bedroom penthouse or a three-bedroom villa. For each course, diners choose from a selection of dishes served by private service staff and a view within the comfort and privacy of their own Hawaiian hideaway. The offer does not include the cost of wine, and is for reservations made by July 31, 2006 for visits occurring before Dec. 15, 2006. Penthouses and villas range in size from 1,900 to 3,100 square feet, with a choice of two- or three-bedroom floor plans. All of the Wailea Beach Villas are appointed with large lanais with built-in barbecues. Other amenities include complimentary high-speed Internet access, fully stocked kitchens and bars upon request, and more. Those who need to travel in style might want to visit the Wailea Beach Villas on Maui, where rates start at $1,100 nightly. The resort, managed by Destination Hotels & Resorts, consists of 98 villas and penthouses overlooking Wailea Beach, consistently rated one of the most beautiful beaches in the world. The property is adjacent to The Shops at Wailea, a myriad of eateries and neighbor to other full-service luxury hotels and destination spas. The complex also features two swimming pools including one that is adult-only, private plunge pools, state-of-the-art fitness facility, business center and activity room. Gated residences feature 24-hour security and front desk reception, bellman/valet services and knowledgeable concierge who are able to assist in pre-arrival itineraries and "au pair" childcare services. Housekeeping and maintenance services are also available in addition to the personal employ of butlers and private chefs. 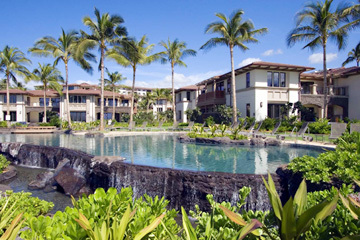 For reservations or information on Wailea Beach Villas, call (888) 808-8770 or visit www.waileabeachvillas.com. Rob and Cindy Pacheco, owners of Hawai'i Forest and Trail in Kailua-Kona, have received the 2006 Ecotour Operator of the Year Award from the Hawaii Ecotourism Association last month. The award annually honors a member who best exemplifies an exceptional ecotourism operation. Hawai'i Forest & Trail is known for emphasizing interpretive training for tour guides. As a result, visitors have a quality experience with consistent correct information. For more on Hawai'i Forest & Trail, visit www.hawaii-forest.com or call (808) 331-8505.